Sometimes you may want to change the login information for your Smartly account. You can change both password and email address from the Your Account section. 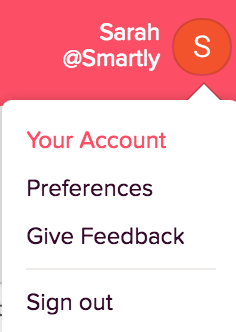 Select Your Account from under your name in the top right corner of your Smartly Dashboard. The first section allows you to change the email address associated with your program. Don't forget to click the blue Save Changes button when you are done! The second section allows you to change your current password. Save changes here too! Once you have saved changes your new account information is in effect.